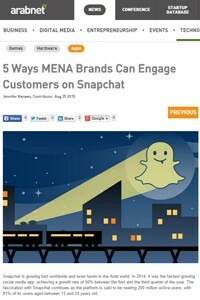 Snapchat is growing fast worldwide and even faster in the Arab world. In 2014, it was the fastest growing social media app, achieving a growth rate of 56% between the first and the third quarter of the year. The fascination with Snapchat continues as the platform is said to be nearing 200 million active users, with 81% of its users aged between 13 and 24 years old.